Erikson's intensely moral, poignant tale will enthrall, an epic of breathtaking proportions. It's evident that the reader doesn't - and shouldn't - understand Erikson's world, a collaborative composition between Erikson himself and Ian C. Esslemont. The term convergence is definitely appropriate, here, as Erikson is seen tying the threads from the preceding novels together into a tapestry that is altogether unexpected; still, he possesses smalls. Albeit minor ones - even sappers have a tendency to launch into philosophical discussion of war, rather than its practicalities. Worldbuilding, however, aided by Erikson's archaeological propensities, is deep, and the numerous texts glimpsed throughout the book provide enthralling, if flawed, glimpses of Erikson's future vistas. Every one of these I read I am drawn more and more to these books. Next year can't come soon enough for me. I am going to try my best to get through my stack here for this year then next year dive into these, even if only one each month. I really like this review. Gives me a little bit of what to look forward to. Thanks! I felt you have a lot of great information here to share that I wanted to let others know and stop by to join in. Thanks! 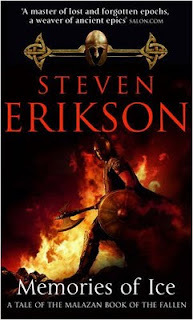 I have to admit, I'm in my Erikson-reread phase right now. I'm looking forward to hearing what you think - as for the award, thank you again! It's very, very complimentary. Just visiting from Melissa @ My World and wanted to say hi and well done on your award. Not a huge fan of science fantasy/fiction but I enjoyed reading your reviews. Thanks. :) Glad to hear you still enjoyed the reviews - I will be covering some non-SFF in the future, but SFF is certainly the focus here! If this book doesn't deserve a 10, then I don't know what does. :P I saved my 10 for DoD, but I agree totally. Melissa(my world) has been trying to get me to start reading this one forever :) I'll have to get them now. Great review, glad you enjoyed it! "(admittedly the slightly weaker book in the series, according to most fans)"
"The term convergence is definitely appropriate, here"
Having read GotM and DG, "convergence" is definitely a word Steven Erkson uses a lot. For whatever, trivial reason. "Gardens of the Moon (admittedly the weaker...)"
I was mentioning it being a worthy successor to GotM and DhG, actually. Sorry.